I connect VCC to 3.3V, CH_EN to 3.3V, GND, Rx (module 7 pin) to ATmega16 TxD PD1, Tx (module 2 pin) to ATmega16 RxD PD0. After I send by USART "AT" command I expect end up in ISR (USART_RXC_vect)... but nothing happend. Did I make correct module connection? There’s a number of things that might not be right. You need to work logically through the problem to solve it. This requires that you perform tests to prove/disprove things. 1. 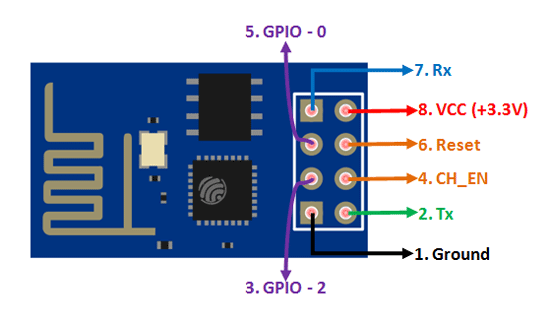 How do you know your esp8266 works? 2 how do you know your mega16 works? I can tell you from experience that the esp8266 is very sensitive about its power supply. You need to ensure you have a good regulated 3.3V supply at around 500mA and very short wiring to the regulator. I have USB-USART module based on PL2303 chip, so one WiFi ESP8266 I connected directly to it -> Try to send "AT" command -> I get responce from module - (41 F5) hex meggase. Another WiFi ESP8266 I connect to ATmega16 -> Rx (module 7 pin) to ATmega16 TxD PD1, Tx (module 2 pin) to ATmega16 RxD PD0. I connected USB-USART PL2303 module to my ATmega16 -> Try to send some symbols -> ISR (USART_RXC_vect) working. Inside ISR (USART_RXC_vect) I make LED blink -> it does. And display symbols send on LED display -> it working. (some issue with ASCII code but it manageable). I can't get any responce from module after I send from ATmega16 simmple "AT" command. (some issue with ASCII code but it manageable). What are you using for the clock source for the micro? An external crystal, or the internal RC Oscillator? If you flash an LED at 1 Hz, does it actually flash at 1 Hz? What is the clock frequency and the baud rate you are using for your communications? ATmega16 with external crystal 8MHz. With USB-USART module based on PL2303 chip I use Terminal v1.9b -> not all ASCII display correct, for example RU simbols. and the baud rate you are using for your communications? To hight speed for WiFi ESP8266? Should speed be lower or hight???? At 9600 baud each character takes around 1ms to send. Your code has a 500ms delay in it. That means you’ll ignore 500 characters. Even without that delay, the lcd functions are slow. How to solve? Look at how the Arduino core code manages the buffering of the serial data using a construct called a ‘circular buffer’. I try to use Termite 3.4 (by CompuPhase). I don't know...need to upgrade to upper version??? Some of commands returns with ERROR message (AT+CWLAP for example). Your baud rate is on the edge of working. Couple that with the baud rate error of the ESP8266, then there's a fair chance you'll have errors. Choose a lower baud rate - like 9600. I calculated your baud rate is 111111 baud vs 115200. That's around 3.6% error. Why 2 stop bits? The usual is 1. That could be your problem right there. I write code as simple as I can. Now I manage to blink LED inside ISR (USART_RXC_vect) -> signal of receiving data by USART. But I don't understant format of data recieved from ESP8266 inside ISR (USART_RXC_vect). It is not ASCII as I guess. So how I should properly transform data received from ESP8266???? to display on LCD or else were??? data format hex, dec or string from ESP8266??? //what happens when you get more characters than SIZE_BUF? // you can't have delays like this in your isr ! // at 115200 baud, each character takes 87us to send. sei();//you send the AT request, then wait 5 seconds then turn on the interrupts. What happens if the ESP8266 replies in less than 5 seconds? Why did you only half do the circular buffer? You need to write a function to see if there is anything in the buffer and another to read the characters out. You don't need to 'transform' the receive data. The ESP8266 sends ascii and you receive ascii. To form a string, you assemble characters until you find a value of 13 (EOL). You then have your string. I will remove LCD display info and LED blink from ISR func -> it is for test only. 5 sec I remove also -> my issue, I miss that. I will think this later. No point in over-complicating things! I played with that device and what worked was 8 data bits, 1 stop bit, 0 parity bits. If you sent "AT" do you get an "OK" back? External 8MHr. Already check from "Examples of UBRR Settings for Commonly Used Oscillator Frequencies" from ATmega16 Datasheet. I think you might have real problems getting 115.2kBaud with 8MHz. I barely got it with a 16 MHz crystal and 2x. I couldn't get it without the 2x, which gives the same error rate as 8MHz with 2x. You might have to put in one of those weird crystal frequencies that give 0% error at all baud rates. Other people here know better than me, but I suspect that is your problem. Yes, you probably right. 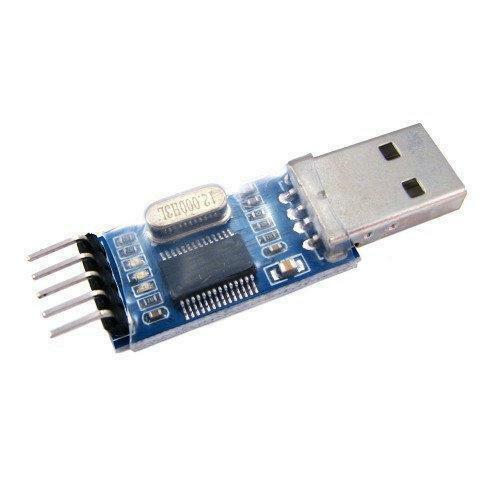 I connect ATmega16 to USB-USART PL2303 chip module and try to send/recieve data with Termite 3.4 (on Termite settings 115200 pbs, 8N1, no handshake) and transfer failed. Will the ATmega16 go to 16 MHz? Edit again: I looked further and some only go to 8MHz. You could overclock it to 11.0592MHz and be good to 230.4 kBaud. But datasheet stand for 115.2K with 8MHz external CPU. I do not understand problem?? why micro can't get 115.2K??? I explained in #10 why. As well, writing to eeprom is slow, so doing this in your isr wont work. For 8Mhz with 2x the error rate is -3.5%. For 16MHz no 2x, the error rate is -3.5% and it didn't work, but when I turned on 2x at 16 MHz the error rate drops to 2.1% from that table, and that improvement was enough to make it work. That was my experience. I think it is kinda hard to change the baud rate if you cant talk to it. Edit: I guess you could use a laptop and an FTDI USB-UART chip to talk to it and change the baud rate in PuTTY, or something like that. OK, now I switch to external 16MHz. And still not good results. I get incorrect data on Termite from Micro and from Termite on Micro I get incorrect data. did you change F_CPU everywhere? do you have to define F_CPU before speed? I tested it. not working. does sending "AT" return an "OK" ? without it no data transfer at all. Configure portD for output. Could it be issue??? Now I connect to Atmega16 my USB-USART PL2303 module -> and view results of transfer data in Termite terminal prog. dont you want to send and receive with UART Rx and Tx? I dont know what pins they are. Are you redefining them by setting PORTD that way after init_UART? OK, so it sounds like 115.2kBaud is working. Right? Kartman's comment about writing to EEPROM being slow means you have to deal with that timing issue. Someone suggested a circular buffer. Yes, ATmega16 -> TxD PD1, RxD PD0. So you dont want to redefine PORTD as output after init_UART. EEPROM for view results of transfer only..allredy remove it from code. And on Termite terminal prog I get incorect results of transfering data. So I guess USART not working or settings not good. What are ASCII 65 and 84? I tested all variables. Nothing work. you need to send a \r too at the end. Wait, with that ESP8266 you need a \r\n at the end, I seem to remember. I can't get a single char to transfer from Micro ATmega16 to Termite correct. Why I need to send \t after any char for proper transfering???? I have no guess why can't sent one char 'A' from Atmega16 to USB-USART PL2303 module and view it on Termite terminal prog. When I connect ESP8266 to USB-USART PL2303 module and send from Termite 'AT' command I get responce 'OK'. 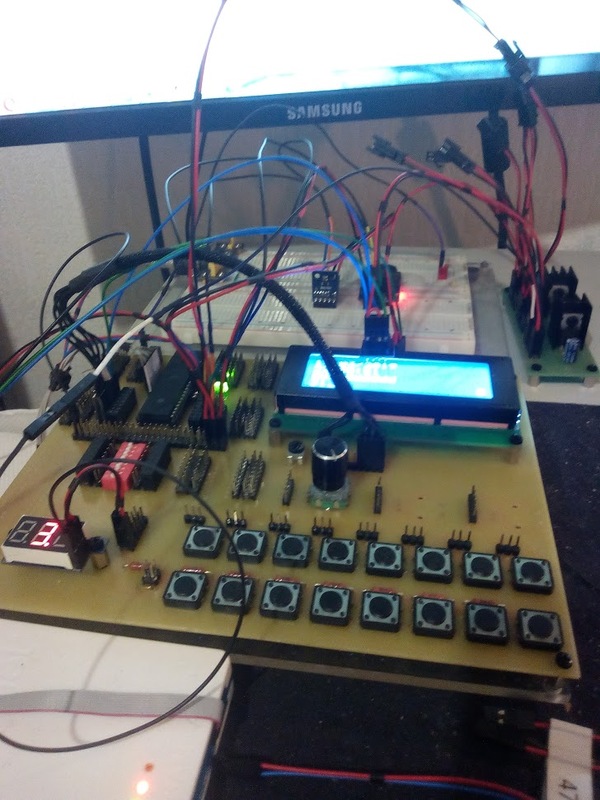 PROBLES is USART on ATmega16. When I talked to it with an FDTI USB-UART and PuTTY i had to send "AT", then hit enter, and then do a cntl-j for new line and I would get an OK back. My PuTTY the implicit LF in every CR didn't seem to work. so it wants a \r\n to complete the command. Sorry about the \t. a mistype. Do you have Rx on the mega connected to Tx on the ESP? Edit: I missed your post that you did. Termite in settings 'Transmitted text' set 'Appent CR-LF' checkbox. Set it and all string in the end go with CR-LF. For ESP8266 that is standart setting. BUT!!!! AS I typed probles is USART on ATMEGA16. I can't send char 'A' from ATmega16 by USART to USB-USART PL2303 module and view it on Termite terminal prog. I thought you said you got UART 115.2kBaud working on the ATmega16.